In a small sauce pot, combine the quinoa and 1 cup [2 cups] water. Bring to a boil, reduce to a simmer, cover, and cook until the quinoa is tender and the water is absorbed, 15 to 20 minutes. Fluff with a fork. Add the lemon zest and half the parsley and toss to combine. Season with salt, if desired, and pepper. Cover and keep warm. While the quinoa cooks, prepare the seafood. Pat the fish dry with a paper towel; season with salt, if desired, and pepper. In a large frying pan over medium-high heat, warm 2 to 3 teaspoons oil until hot but not smoking. Working in batches if needed, add the fish (skin side down for the salmon) and cook until lightly browned (and the salmon skin is crisp), 4 to 5 minutes. Turn and cook until the flesh is opaque and flaky, 2 to 4 minutes. Transfer to a plate, cover, and keep warm. Add more oil between batches if needed. Wipe out the pan. While the fish cooks, prepare the green beans and garlic. Pat the scallops dry with a paper towel; season lightly with salt, if desired. In a large frying pan over high heat, warm 1 to 2 teaspoons oil until hot but not smoking. Working in batches if needed, add the scallops and cook without turning until golden brown on one side and starting to turn opaque, 2 to 4 minutes. Turn and continue cooking for about 30 seconds for translucent or 1 to 2 minutes for opaque. Transfer to a plate, cover, and keep warm. Add more oil between batches if needed. Wipe out the pan. While the scallops cook, prepare the green beans and garlic. Trim the stem ends from the green beans. Finely chop, press, or grate enough garlic to measure 1 teaspoon [2 tsp]. In the same pan used for the seafood, warm 1 to 2 teaspoons oil over medium-high heat until hot but not smoking. Add the green beans, season with salt, if desired, and pepper, and cook without stirring until starting to blister on one side, 1 to 2 minutes. Using tongs or a spatula, flip the beans and cook until blistered slightly on the other side, 1 to 2 minutes. Stir in the garlic and cook until fragrant, about 30 seconds. Remove from the heat and season with salt, if desired, and pepper. In a small sauce pot over medium heat, whisk together the Dijon sauce base, coconut milk, and 1 teaspoon [2 tsp] lemon juice and cook, whisking constantly, until warmed through and thickened slightly, 2 to 3 minutes. Remove from the heat and season with salt, if desired, and pepper. Transfer the green beans and quinoa to individual plates. Top the quinoa with the seafood and spoon over as much Dijon sauce as you like. Garnish with the lemon wedges and remaining parsley and serve any remaining Dijon sauce on the side. Garnish with the lemon wedges and parsley. 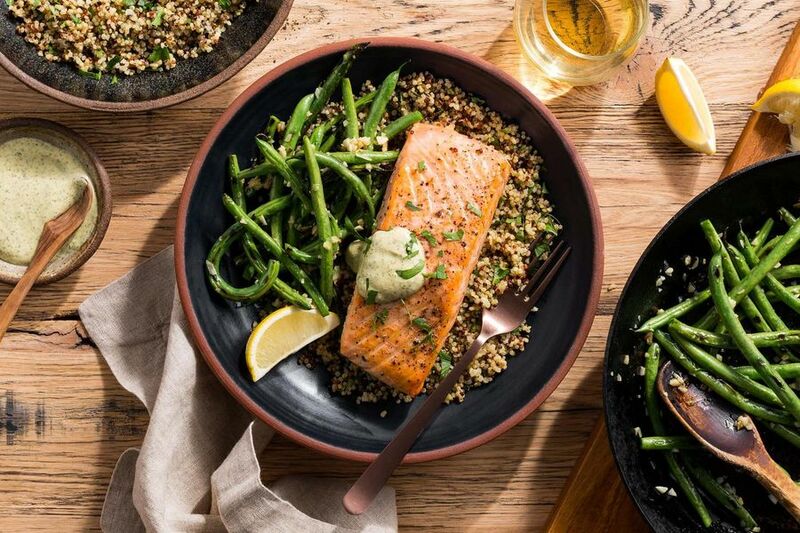 A lemony mustard sauce takes this dinner-party-worthy seafood dish, complete with high-protein quinoa and fiber-packed green beans, to the next level. The Heart-Check Certification indicates the recipe meets the American Heart Association®’s nutrition requirements. To remain at or under the maximum 600mg sodium per serving, use no more than ¼ teaspoon salt to season this recipe. We also recommend using the lower amounts of oil suggested for preparation. It’s common to trim both ends from green beans but not necessary. Chef Justine saves time (and food waste) by trimming only the tough ends where the beans are snapped off from the stalk. The tapered tips are tender enough to eat. Save one-third of the cooked quinoa for a future use and slash 60 calories and 10 grams of carbohydrates per serving. The next day, enjoy the remaining quinoa with eggs for breakfast or on a salad at lunch. Calories: 370, Protein: 34g (68% DV), Fiber: 6g (24% DV), Total Fat: 15g (23% DV), Monounsaturated Fat: 8g, Polyunsaturated Fat: 2g, Saturated Fat: 3.5g (18% DV), Cholesterol: 105mg (35% DV), Sodium: 320mg (13% DV), Carbohydrates: 24g (8% DV), Total Sugars: 5g, Added Sugars: 0g (0% DV).